Traffic accidents are a leading cause of death in Lima, Peru. Photo by Pool Ramirez. In a new Discovery Channel show, host Andrew Younghusband drives viewers through some of the world’s most dangerous streets. In a recent episode, Younghusband focuses on the traffic dangers in Lima, Peru, the city with the highest number of traffic fatalities per vehicle in Latin America. The show, titled, “Don’t Drive Here,” features tongue-in-cheek banter about road conditions and local vehicles, along with zany driving stunts by an energetic Younghusband. But underneath the goofy veneer is a very serious message about the dire need for improved road safety in Peru. In the opening seconds of the show, Younghusband stands amidst the congested traffic of Lima and shares this information with the camera: that for every 100 vehicles on the road in Peru, 2.7 people will die. 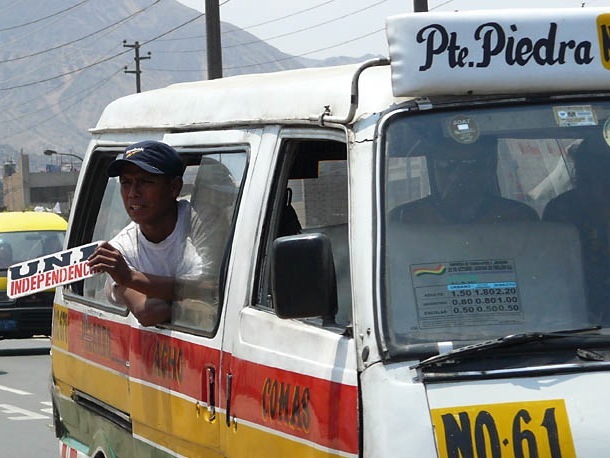 Despite laudable efforts to improve road safety in Peru, there is a long way to go. According to The Global Status Report on State Road Safety 2013 released by the World Health Organization (WHO), Peru’s roads are among the most dangerous in Latin America, contributing to one of the highest premature death rates of 15.9 per 100 inhabitants. As “Don’t Drive Here” explains on their factsheet, traffic accidents are the leading cause of death for children 5-14 years old. Work continues across Peru to reduce the number of fatal accidents. In the meantime, Younghusband’s catch phrase may serve as good advice: don’t drive here.